More women in Scotland are choosing self-employment and business creation as a career choice. Being your own boss, doing what you love and managing your own working hours can be good options for the 20% of businesses majority owned by women. These businesses currently contribute £5bn to the Scottish economy. That’s more than the Food and Drink sector at £4.1bn, Sustainable Tourism at £3.9bn and Creative Industries at £4.4bn. Plus, if women started up in business at the same rate as men, the economy would be boosted by a further £7.6bn. Women’s entrepreneurship is critical to the future prosperity of the economy and Scotland’s innovation, productivity and competitiveness. 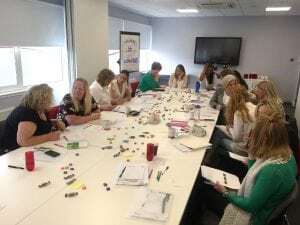 Lead With WES, first launched at the end of 2016, is a programme designed for women business owners wishing to lead their business through growth to become a sustainable, high performing organisation. The programme launched at the new enterprise hub in Glenrothes and comprised of 4 face to face training sessions over 9 months, with digital support in between. The programme aims to help businesswomen increase their leadership skills and confidence. In particular enabling them to strategically analyse their business against their vision for the future. Helping them to develop, implement and evaluate strategies to grow their business using models and tools. In the words of Michelle Obama, who spoke at a recent Dinner in Edinburgh, “There is no limit to what we, as women, can achieve”. Initially, 10 places were made available on the programme at Glenrothes, but they all booked out very quickly. Fortunately, the training room in the enterprise hub could be extended and in the end, 20 female business owners were able to take advantage of the training programme. The programme has evidenced a good deal of success – increased turnover, moving to new business premises, taking on staff etc were all outcomes – in addition to boosting the leadership capability and confidence of participants for the future. Due to demand, the second Lead With WES programme was launched before the first course was complete. All 20 places booked out quickly again. This second programme is finishing now and we are just about to launch the third leadership course in Glenrothes. If you are based in Fife and wish to attend the free course, contact us via the website details below. The Lead With WES programme is part of Fife Council’s submission shortlisted for the Enterprising Britain Awards this year and we await news of the final outcome and winners. Another Lead With WES course is underway in Edinburgh although this programme is full having booked out in 24 hours. In both Glenrothes and Edinburgh we work with many fabulous women-owned businesses from a company using tech to revolutionise fish transportation and storage, to the re-launch of a traditional soft drinks brand, an author and expert in psychopaths who has a show on tour and an innovative grey water recycling business…..the variety is extensive. There is a lot of peer support when tough business challenges require to be addressed and plenty celebrations when key business milestones are achieved. As the programme goes from strength to strength we hope to gain more funding so women in other local areas can have the opportunity to benefit. Sign up to our monthly newsletter to stay informed about all our courses, our events and news on other ecosystem events and opportunities. Share with your own networks and friends so everyone can be aware of the support and opportunities for women considering their own business start-up as a career. Check it out before you rule it out and you could be running your own business in the future.